Unlike in Red Dead Redemption, in Red Dead Redemption 2, players can't cross the border into Mexico. But they can glitch there. A Reddit user by the name of "Coyotemation" posted to the game's official sub-Reddit, revealing that they, somehow, glitched into Mexico in Red Dead Redemption 2. And they had the images to prove it. According to the Reddit user, the entirety of the Mexico terrain in Red Dead Redemption 2 is just the terrain from Red Dead Redemption ported over. There's no new work done on it, but it does look better thanks to engine improvements. The only modelled place is apparently the El Presidio, but otherwise everything is a one-for-one. And even the El Presidio looks nothing more than a model port. Meanwhile, the watchtower is literally the same amount of crates a top it, and the textured details on railing are identical. 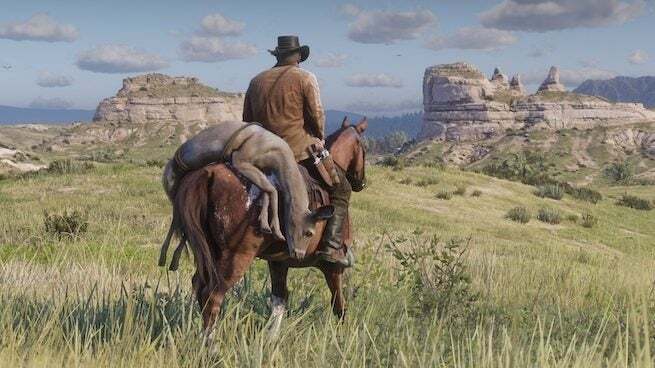 With Red Dead Redemption 2 opting to leave out Mexico, many fans have speculated that it will come later, whether via Red Dead Online or single-player DLC, though given that GTA V never received the latter, makes it unlikely that it would be added in that fashion. At first, some thought that this was further evidence that Rockstar Games' was planning to add onto the map sometime down the road by clipping Mexico on. The line of thinking being: why would Rockstar Games add Mexico and its location into the game if it didn't plan on using it at some point? And this is a valid question, but it can be answered pretty simply. They needed a model. In Red Dead Redemption 2, you can to the southern part of New Austin, where the river separates the U.S. from Mexico. If there was nothing on the other side of it, that would look very strange. And so rather than create new resources for just background dressing, it's possible Rockstar Games' simply ported the model of the map from Red Dead Redemption. This wouldn't only be a time-saver, but a resource-saver. That said, it doesn't close the door on Mexico being made playable in the future. It just shouldn't be used as evidence that it will be added. "The way to get into Mexico is in the far west of the map, near 'Sea of Coronado' in New Austin. Check your map and look at the "hump" of land next to the "na" in 'Coronada.' In there you will find a creek, which narrows. You can cross the river into that creek, and you follow it until two landmasses meet at the narrowest point. Get on your horse, fill it with Stamina goodness (or use a cheat, like I did), and mush up against the crack. If you fiddle around with the joystick a bit your horse should begin to climb up a bit. This is when you start mashing jump and sprint and your horse will fly up a bit but get stuck. Hop off it and the player will begin to "slide" around. This is Rockstars' anti-fun mechanic to keep you in the play-area. Just fight against it, mash the sprint and jump buttons and try to go in literally any direction other than where it wants to take you. It'll take a few tries, but you'll eventually glide right into Mexico. Your horse won't make it with you and will be stuck where it is for now." Red Dead Redemption 2 is available for PlayStation 4 and Xbox One. For more news and coverage on the open-world western, click here.